Six months after making the game "free," Turbine says Lord of the Rings Online is earning triple the revenue it did as a subscription game. Lord of the Rings Online wasn't a train wreck when Turbine decided to make it free-to-play in mid-2010, but it's a safe assumption that it wasn't a smashing success either. But much like Dungeons & Dragons Online, which made the same transition in 2009, eliminating the mandatory fees in the Middle-Earth MMO has made a very big difference in the game's fortunes. In a Ten Ton Hammer podcast, Turbine Director of Communication Adam Mersky compared the LOTRO revenue increase with that experienced by DDO, which saw a 500 percent increase several months after going free-to-play in September 2009 and continues to operate successfully. 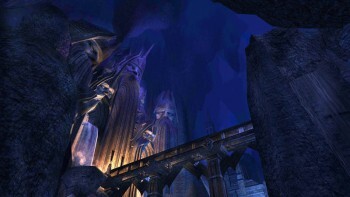 Executive Producer Kate Paiz added that Turbine is "super-pleased" with the growth of the LOTRO player base since the game went free. "This really echoes a lot of what we've seen throughout the entertainment industry in general," she said. "It's really about letting players make their choices about how they play. People are like, 'I own my choices. You give me the power and I'll decide if you're cool enough for me.'" The free Lord of the Rings Online allows players to buy optional quest packs and other virtual items on an "a la carte" basis, while serious fans can still pay a monthly subscription fee for unlimited access to everything.